Heath Riles & Malcolm Reed. Neither man require a formal introduction in the world of BBQ, but just in case you’ve been living under a rock, here’s a quick rundown of their combined accomplishments, features, and awards! 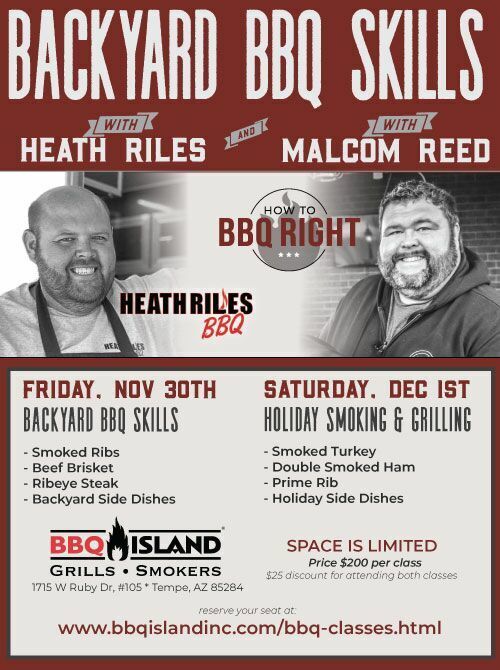 *Meet Health Riles and Malcolm Reed in person at BBQ Island’s next cooking class on Friday November 30th and December 1st! Heath Riles: The man’s accomplishments and contributions to the BBQ industry are unmatched! • Named Memphis BBQ Network Team of the Year as a result of sweeping all three categories (Whole Hog, Shoulder, Ribs) and having won nine out of the ?fteen Memphis BBQ Network contests in which he competed. Add to this the fact that Heath and his team, ?nished 3rd overall in the BBQ Division of the World Food Championships in Las Vegas. • Established that he had not only mastered the competition style in the Memphis BBQ Network, but also the unique style practiced in the Kansas City BBQ Society competitions. Heath won twelve Grand Championships out of the thirteen Memphis BBQ Network contests they competed in, and also racked up ?ve perfect “180” scores in Kansas City BBQ Society contests. • In July, Heath established a ?rst for any team in the entire country – they won “Grand Champion” in Memphis BBQ Network style and Reserve Champion in the Kansas City BBQ Society style at the major competition held in Galax, Virginia. • As if competing in competitions sponsored the two principal barbeque sanctioning bodies wasn’t enough, Heath launched another facet of his career by competing in events sponsored by the Steak Cook-off Association (SCA). In short order he became one of the top competitors in the organization. • On a more personal side, the various sauces, rubs and other products Heath had developed were among the top winners in the Awards of Excellence Competition. • Entering 2016, Heath decided that he would focus on the Shoulder and Rib categories in the contests in which he competed. Heath went on to be Memphis BBQ Network Team of the Year once again, along with being Pork and Rib Team of the Year with nine Grand Championship wins in Memphis BBQ Network competitions and two Grand Championship wins in Kansas City BBQ Society competitions. In April, Heath became the only team in the country to win both Grand Championships on the same day at a dual Memphis BBQ Network and Kansas City BBQ Society contest held in Southaven, Mississippi. In November, Heath became only the second person from outside the State of Georgia to ever win the Grand Championship at the Big Pig Jig in Vienna, Georgia. In the very next week, Heath competed in the World Food Championship held in Orange Beach, Alabama, and once again made the ?nal table in BBQ Division by placing in the top ten overall. • Heath once again took home the title of Memphis BBQ Network Team of the Year along with being named Pork and Rib Team of the Year. • Heath decided that the “next step” in his career path was in order. He transitioned from the Victory Lane BBQ team to Heath Riles BBQ. His products will continue to constitute a national brand bearing his name, something that had always been his dream. As the year unfolds, Heath is off and running to achieve even greater success. Malcolm Reed: With close to 400k Youtube subscribers, you’d be crazy not to take this man’s BBQ knowledge and advice as the gospel truth. As the years go by, the skill and knowledge that these two possess will continue to grow. BBQ Island proudly supports Heath Riles BBQ and How To BBQ Right. Get your tickers for our next class here.